Many of you may recall the Corsair Carbide Air 540 as the head-turning case from CES 2013. This was thanks to is double wide design which was, at the time, typically reserved for custom-built extreme liquid cooled cases. Well Corsair is going to stick with their guns on this design choice and has released a new Corsair Carbide Air 540 is snow-white, just in time for the holidays! While still a mid-tower in height (18 inches (457 mm)), the Air 540 is a stout 17 inches (432 mm) wide giving it a cube-like appearance. This allows for some unique use of space allowing it to support up to extended ATX motherboards, radiators up to 360 mm, and graphics cards up to 12. inches (320 mm) in length, all at the same time. This is not something your standard mid-tower case can pull off. The Carbide Air 540's double wide design also allows you to control the temperature zones and keep everything cooler. The power supply and primary 4 bay HDD cage are on the right side of the case away from your main heat sources. This improves the life of HDD and ensures the air coming into the left side is not being "pre-heated" by your mechanical drives. The left side also has an over-sized window to show off all that PC horsepower. I also want to throw out there that this could be the perfect base for a Companion Cube case mod. Just saying. With the new addition, you now have the color options of the original black and silver with the new white color. And best of all, it looks like the you can still find the Corsair Carbide Air 540 in white for as low as $110.99. Full press release is posted below. 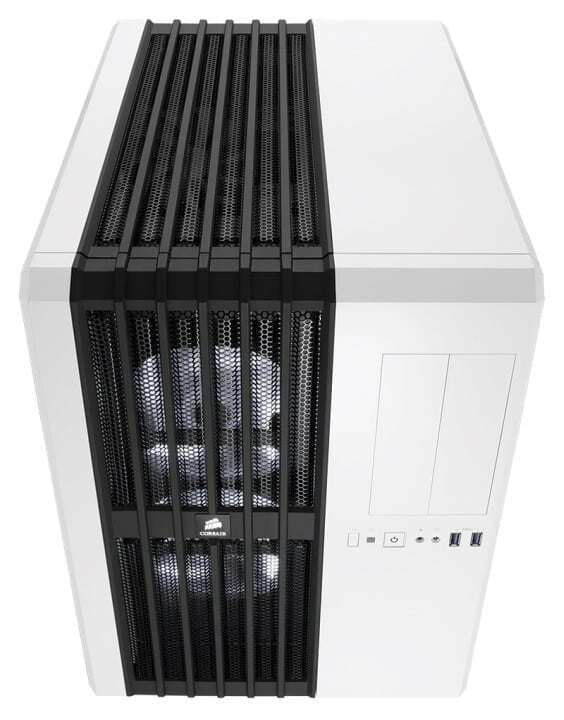 December 12, 2013 — Corsair®, a world leader in high-performance components to the PC hardware market, today announced that the Carbide Series Air™ 540 mid-tower PC Case is now available in arctic white in addition to the previously available black and steel silver colors. The Air Series 540’s innovative high-airflow layout and striking looks have won it over 40 awards from top PC reviewers worldwide. The Carbide Series Air 540 is designed with a wider form factor with two “side-by-side” chambers and a unique Direct Airflow Path™ layout. The layout in each chamber is optimized to limit obstructions and streamline airflow from the intake fans to the hottest PC components, allowing the Air 540 to provide best-in-class cooling at low noise levels. The main chamber of the Carbide Series Air 540 houses the motherboard, graphics cards, and hot-swap 3.5” drives for superior drive cooling and quick swapping. The second chamber holds the power supply, SSDs, and 5.25” drives behind the motherboard tray. The separate compartments make building a breeze and provide cleaner cable routing and superior cooling for hotter devices. Both the arctic white and steel silver editions include white LED AF140L front fans. 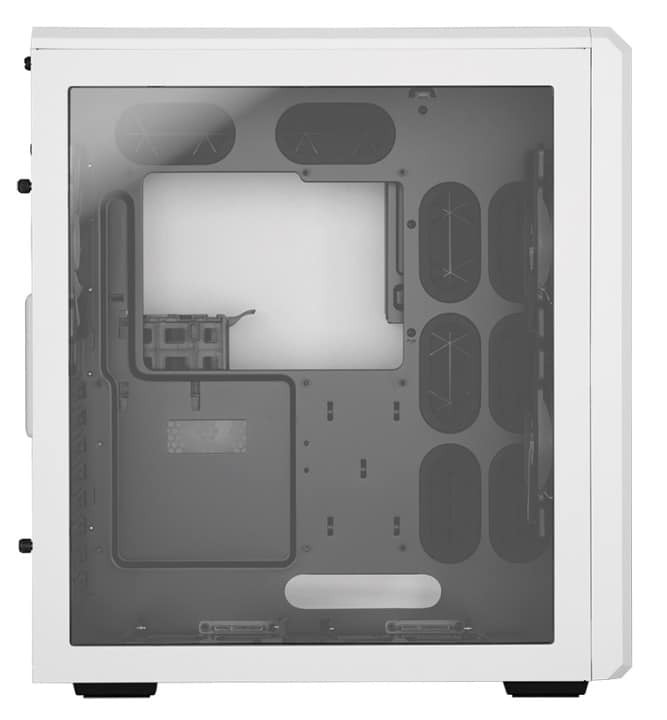 The Carbide Series Air 540 White Edition has a list price of $149.99 USD and is available from Corsair's worldwide network of authorized distributors and resellers or on the Corsair webstore. The case is backed by a two year warranty.